I can't stop playing with the things I learned in the 21 Secrets Just add Water class so far! I have to say that I'm beginning to explore some materials I played with in a certain way so far and it's interesting to take it to a different direction and to find it to be more versatile. I have strayed from the original techniques and materials. It's like learning the alphabet which is the same for everyone speaking a certain language but then writing your own unique story with it. You can see my first page using the Oil and Water technique here. I see a difference between that first page and this one. I'll share more pages as I go. If you want to sign up, You still have a few days left but hurry because registration is about to close! Welcome to the 5th and final day of my Blog Series – Summer Art Journaling June Inspiration. I am sharing an image of my art journal page, my thoughts behind the page and my supply list. Sometimes I wish for wings so I can soar above to get a 360 degree view of the bigger picture… I think that would give me a better perspective of me in the context of everything and save me the heartache of realizing too late that all along I HAD ALL I NEEDED INSIDE OF ME. *Some are affiliate links. All contents, words and images are copyright of Mou Saha. Welcome to my Blog Series – Summer Art Journaling June Inspiration Day 4. I am sharing an image of my art journal page, my thoughts behind the page and my supply list. Sometimes, on the surface, things look the same old, same old. But nothing could be farther from the truth than thinking that things are static. There’s a transformation happening far beneath the surface. It just hasn’t manifested itself yet. Sometimes, you need to dive deeper to get a glimpse of the mystery that will manifest someday. Welcome to my Blog Series - Summer Art Journaling June Inspiration Day 3. I am sharing an image of my art journal page, my thoughts behind the page and my supply list. Sometimes, I'm simply physically tired because 'artist' is not my only role in life. I'm a mother and a wife among other things, each of which is demanding and fulfilling in it’s own way. At times, when I really want to drop everything and create, I still have to do laundry, dishes, make lunches, clean up after the dog, offer emotional support to my teenage daughter, hear my tween son vent about unfairness and push my three-year-old in the swing. All of these make me who I am AND contribute to my art. It has taught me to cherish the most valuable thing - TIME - with others and with self. Welcome to my Blog Series - Summer Art Journaling June Inspiration Day 2. I am sharing an image of my art journal page, my thoughts behind the page and my supply list. Sometimes, I just can't justify diverting funds to buying all the new goodies that call my name oh so seductively. I end up dedicating that money to buying new pointe ballet shoes for my oldest who squeals out, “Mommy, I love you!” or buy a new toy for my youngest whose face would light up so sweetly because she was not even expecting it. These little moments of joy marinate in me and seep into my art which I have learned to modify to work with things I have at hand. The most important skill is to learn HOW to play. Welcome to my Blog Series - Summer Art Journaling June Inspiration Day 1. I am sharing an image of my art journal page, my thoughts behind the page and my supply list. Sometimes for me, creativity flows in abundance and sometimes it's a tiny trickle. Whatever it is, I have learned to embrace it and wait for the next tide to come in. Just a heads up... starting Monday, June 25th, I'll be posting an art journal page each day for a week here on my blog. My goal is simply to offer you some inspiration during these sluggish hot days so you can brush up on your creativity and not completely fall off the crafting wagon. I'll list the supplies I used. You choose from what you have and/ or want to use. You don't have to make the pages to look like mine if you decide to play. I want to give you some starting points and not directions, so you can explore freely. Be sure to stop by from Monday to Friday for a new piece each day. Summer vacation has officially started here. There will soon be mad rush with summer camps some of which are already under way but today I’m playing and watching FIFA. If you too are looking to boost your summer creativity, check out the self-paced 21 Secrets workshops. You’ll have fun with the short doable video workshops! As soon as you register, you’ll get a welcome email with access to the first class. Here’s my take on the first class by Connie Solera out now. 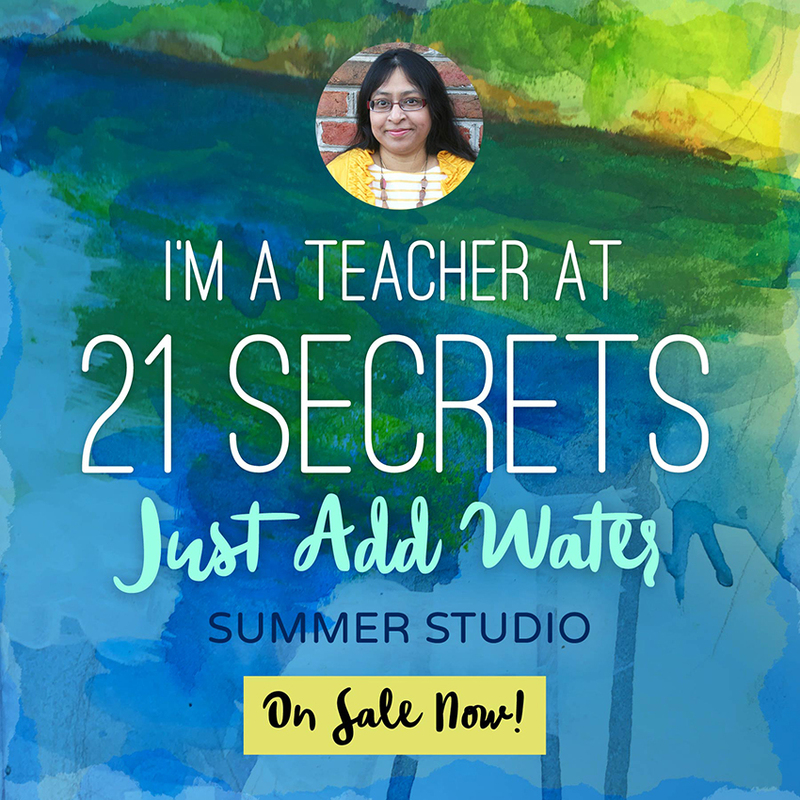 This summer I’m joining Connie Solera and nine other artists to bring you 21 Secrets - Just Add Water! This workshop will be available as three downloadable videos from each teacher emailed directly to your inbox starting July 9th. There will also be an e-book. Right now, ending today June 8th 2018, there’s an early bird sale where you can save $10 off your registration fee of $55. 21 SECRETS Just Add Water will cost $55 or can be purchased in a bundle with 21 SECRETS The Great Outdoors for $98.